Eviado ONE hybrid HDTV Twin Satellite Receiver, The Eviado ONE high-quality HDTV Twin satellite hybrid set top box with integrated browser allows access to Eviado web portal CE-HTML and on the free Internet .The link for this can quickly and easily via LAN or WLAN done and binds the box into existing home networks a .Etc. PC hard drives , Media Centerare thus available . Currently the largest TV app portal in the German market offers a variety of interesting content to complement the conventional television enjoyment.This extensive eviado Web on TV offering is constantly expanded and updated automatically .Thanks Programming in CE-HTML , these apps quickly and uncomplicated navigate with 6 buttons on the eviado one- remote control and are represented in a very vivid and legibly on the TV. 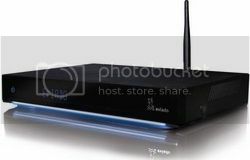 As a special highlight , the receiver has the watchmi Personal TV function as a mature recommendation system for recording planning and creating personal channels .The free TV Digital EPG supplies the necessary data and presents interesting information and pictures about the current TV for the next 14 days. The eviado one is HbbTV compatible and offers by the two intergrierten CI (CI) slots the possibility of additional pay-TV subscription cards and modules to receive encrypted channels .An integral component is a PVR function via USB3x and 1x eSATA ports .